WASHINGTON—Issuing a series of threats and warnings to gain the East Asian government’s cooperation, an angry Donald Trump Jr. and Eric Trump reportedly shouted “You better give our dad a good trade deal or you’ll be sorry!” while on the phone Thursday with an employee of a local Chinese food restaurant. “If you don’t stop trying to do bad things to our dad’s smart idea for a trading deal, you’re gonna be in a whole lot of big trouble,” said Donald Jr., repeatedly interrupting the confused employee’s efforts to ask for their order to criticize the Chinese government ramping up a trade war with the United States, then covering the speaker with his hand and assuring his brother that “they’re definitely super afraid of us and gonna give in.” “Look, we got way cooler stuff than you guys, so you better keep letting our junk into your dumb country. And tell your pal King Jong-un [sic] not to mess with the trade deal either, or Dad’s gonna be real mad and then nuke all of you with the army. We need 100 more dollars to make the deal work and that’s our final offer. And no trade-backs! 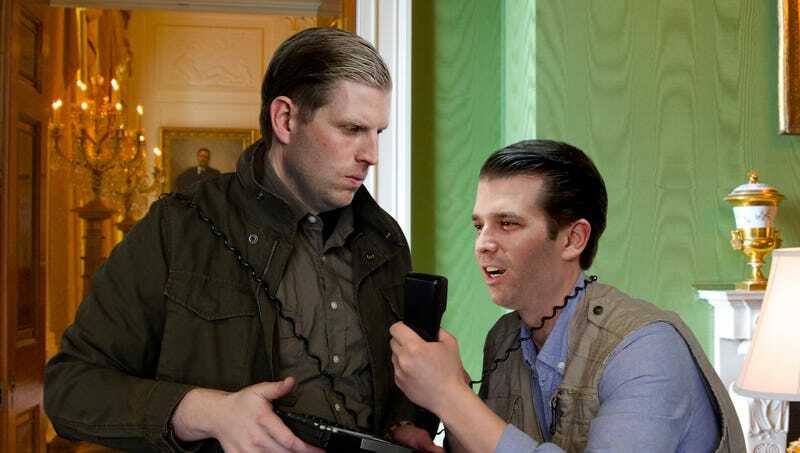 Hold on, my brother wants to yell at you now.” At press time, the baffled restaurant employee was trying to confirm the order of a large General Tso’s chicken and pot stickers while the Trump boys frantically tried to untangle themselves from the phone cord.